Refugees from several countries numbering 1442, who had entered the island illegally during the past period, had been protected by the office of the United Nations High Commission for Refugees (UNHCR) in Sri Lanka. 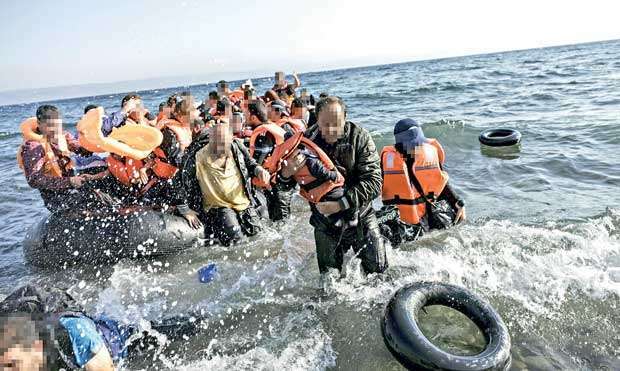 These refugees, under the guise of entering the country as tourists on visa facility provided by the Government, were later identified as those seeking refuge in the island. They later revealed their modus operandi which is indeed a racket in pursuing permanent residency. In addition to them there were more than 10,000 who were identified early. They were detected on arrival at the airport and deported by the officers of the Department of Immigration and Emigration. However 805 individuals out of the 1442 stationed in Sri Lanka had been offered permanent residency in USA, Canada and some other countries. The (UNHCR) is further conducting inquiries regarding the remaining 637 people. Similar to these people nationals from Pakistan, Afghanistan, Myanmar and Rohingya are continuing their stay in the island. The entry of these refugees, which can be termed a racket, in large numbers has now become a major human trafficking issue. According to the information available at the investigation unit of the Department of Immigration Emigration, the kingpins of this racket are charging a sum between USD 15,000- 20,000 per individual to be sent as a refugee to Sri Lanka. It was further revealed that one of their representatives visits the airport to unsure that they are cleared. This racket is being operated on a large scale and an agent of the racketeers coordinates the operation while residing in the island. His duties are to direct these refugees to the office of the (UNHCR) and also to provide them with board and lodging. Many have attempted to gain entry to the country using faked passports and by changing their religions. There are no records of the number of individuals who are staying in the island and have not come under investigation. The Department of Immigration and Emigration has total authority to take into custody and deport any foreign national who remains in the country without a valid visa. Sri Lanka first witnessed the arrival of refugees on 03rd of May 2008. They were nationals of Bangladesh and had arrived via the Mullaitivu coast. On their arrival they had been taken into custody by the Sri Lanka Navy and steps were taken to deport them. The racketeers had identified Sri Lanka as a country where the racket of human trafficking can be easily operated. This they have done by taking into its consideration the geographical location. The racketeers are fully aware that the rules and regulations applicable to foreign nationals are minimal. Therefore after obtaining visas for about four weeks or a month these individuals, on arrival, initially forward an application to the UNHCR seeking refuge status. This step prevents the Department of Immigration Emigration from taking any action to arrest them. The UNHCR office then protects them and provides them with board and lodging. This office looks after the educational facilities of the children. These nationals in the future are likely to request for political asylum claiming that they are unable to live in their countries due to political and economical hardships. The last group that entered the country illegally did so in 2014 and they were taken into custody. Since then no one who has registered with the UNHCR has been taken into custody by the Department of Immigration and Emigration. Presently most of them are residing in the Negombo area in rented out premises. With the tightening of investigations by the Department of Immigration Emigration these groups are seeking alternatives. Some are visiting Dubai, Maldives, Singapore and Malaysia as tourists while others enter the island through transit visas and obtain the protection of the UNHCR. When inquiries were made regarding this matter from the Visa and Provincial Controller of the Department of Immigration and Emigration Chaminda Hettiarachchi, he said that though the Sri Lankan authorities haven’t signed the agreement of the United Nations on refugees, as a member country of the United Nations Sri Lanka is morally bound to consider the plight of these refugees on humanitarian grounds and offer them protection. Therefore once they are registered with the UNHCR they cannot be taken into custody. Hettiarachchi added that there is no possibility of them entering the country illegally. He said that he was unable to comment on the matter with regard to the illegal entry of refugees as it involves state diplomatic relationships. Through the investigations conducted by the officials of the Department of Immigration and Emigration it has been revealed that this racket is conducted on a large scale by a Religious group in Pakistan identified as AHMED sect. Some groups using their relationship with certain Embassies had tried to influence the officials of the Department of Immigration and Emigration and have been successful in obtaining the release of some of them. The human trafficking observed in Asia is also operative in Malaysia, but as there is a rigid policy enforced in those countries, the racketeers focus their attention more on Sri Lanka. Therefore assigning immigration officials to Karachi and Islamabad in Pakistan had been considered in order to avert this trafficking menace. This decision was taken because those who obtain visas on arrival have to be checked during a very short period at the airport. As a result these refugees easily gain access to a country. When a number of flights arrives at the airport at the same time and due to the work load of clearing passengers on arrival becoming more demanding and time consuming, the delay that follows has assisted these groups to enter the country. Therefore the measure of checking their visas in the country of departure would provide officials with the facility of checking their documents prior to them starting their travelling. There are reports suggesting that there are very powerful personalities behind this racket. Some of them include the politicians of this country. With the intensified checking conducted at the island’s airport these groups are attempting to make use of the sea routes to migrate into the country. This had prompted the department to set in motion a special security plan to arrest this situation. This procedure sees the deploying of officials in Tourist Navy Crafts. When a group of officers from the Department of Immigration and Emigration met President Maithripala Sirisena recently, they had requested that a selected group of officers from the department be enlisted in the Sri Lankan Embassies. The President had said that as there appears to be a lack of confidence in about 50% of the officers serving at these embassies they are to be removed shortly. The President had added that their request would be considered in the future. This meeting was also attended by Minister of Internal Affairs S.B. Navinna. The Rohingya refugees, who came under the spotlight recently, have received permission to settle down permanently in a suitable country. Sri Lanka had in this manner earned the reputation as a country for racketeering. There is a continuous arrival of groups to the country seeking political asylum. The Investigation Unit of the Department of Immigration and Emigration has cautioned that there is a possibility of Sri Lanka being used by ISIS and Al Qaeda terrorist’s organizations as a centre to operate from. This is because they too believe that Sri Lanka is geographically ideal for this kind of activity. This was amply proved by the detection of foreign currencies, Gold, Medicinal Herbs, Drugs and other prohibited stuff in large numbers at the airport during the recent past. Air and sea passages had been used by the racketeers for their activities. During certain instances they had found some state officials conniving with these racketeers. It’s very peculiar to note that most of the emigrant refugees hail from Pakistan and are political emigrants. Some of them after obtaining registration with the UNHCR find employment as workers. The assistance offered by the representatives of these racketeers had helped the refugees to find employment. Despite the applications forwarded by them seeking refugee status from the UNHCR had been rejected they continue with this application process submitting false information. The majority of these individuals hold the view that once setting foot in Sri Lanka it is very easy for them to migrate into other countries. Despite the measures taken to control the issue and other security systems being in place, these emigrants adopt systems to counter all these moves. This has affected the visa system now offered to genuine travellers. The Goverment’s intention is not to tarnish Sri Lanka’s image in its dealings with Pakistan, Myanmar and other countries. Sri Lanka is presently bent on increasing tourist arrivals. The number of emigrants, who enter the country illegally, is also added to the number of tourist arrivals. Meanwhile there are many emigrants, who had entered the country illegally, and are now employed in various projects as workers. When Government Department In-charge of the International Organization for Migration (IOM) Shantha Kulasekera was contacted, he said that the organization’s responsibility is to protect the Sri Lankan border by preventing illegal emigration. Several projects had been introduced to the Department of Immigration and Emigration. Implementing those projects had been conducted by the Government of Sri Lanka. “The aim of these projects was to increase tourist attraction in the country. But there is the issue of tourists arriving as refugees. Several incidents have been reported with regard to tourists arriving as emigrants from countries like Bangladesh, India and Nepal.,” Kulasekera said. Therefore, every country should see that it is benefited when arranging visas,” he said. When this matter was posed to reputed Attorney Laxhan Dias, he said that as Sri Lanka hasn’t signed the United Nations Agreement on refugees, no refugee had been welcomed in keeping with International regulations. However with the establishment of an office of UNHCR in Sri Lanka the office has intervened in this matter. It’s evident that this racket is not only operating in Sri Lanka, but is also present in countries like USA, Norway, South Korea and Europe. Dias also pointed out that this human trafficking racket would not in any way affect the country. He also added that this issue wouldn’t negatively affect the state nor the economy. 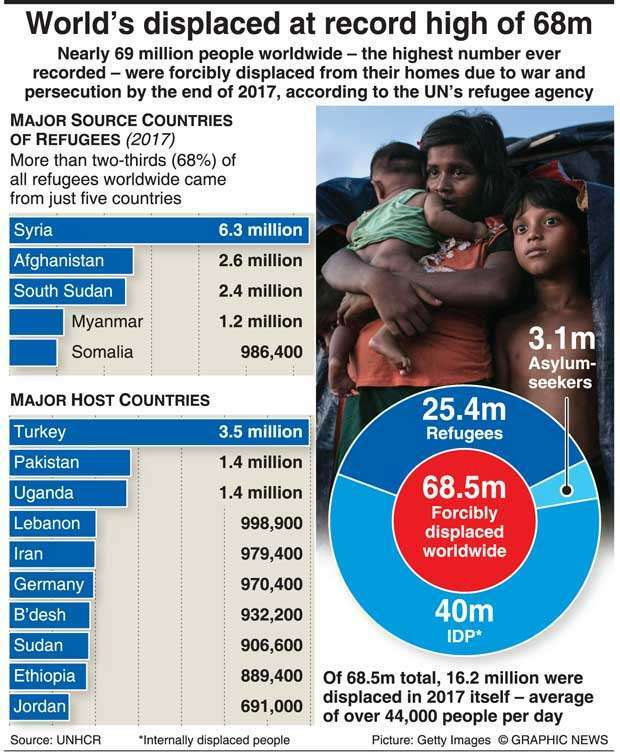 It’s reported that presently there are nearly four million refugees in Malaysia. No country in the world accepts all these people who seek refugee status. It’s known that there are Government officials and racketeers, belonging to various organizations, behind this racket. If an individual continuously states that he is unable to live in a country, the UNHCR intervenes and finds him a suitable country to live in. If a country enjoys total democracy there is no need to emigrate to a another country. During the recent past there have been many in the political field who sought security for their lives and illegally emigrated to other countries. Even at present there are more than 100,000 Sri Lankans living in India as refugees. However it’s the responsibility of the UNHCR to protect any person who seeks asylum in another country through Sri Lanka. This is done by adhering to stringent regulations. However refugee status cannot be obtained by producing fake documents. If refugees don’t enter the country as tourists, the Department of Immigration and Emigration has the right to turn them back, Attorney Dias stressed further.